After children aged 4 years and under, teens aged 15 to 19 have the highest rate of reported invasive meningococcal disease of any age group in Canada. Are you a teen heading to a new school? Ask your doctor about Nimenrix before you go! Nimenrix is recommended before travel to a region extending from Senegal in the west to Ethiopia in the east (The Meningitis Belt). What is invasive meningococcal disease? Even when the disease is diagnosed and treated early, 5% to 10% of patients die, typically within 24-48 hours after the onset of symptoms. There are several serogroups of the bacteria. 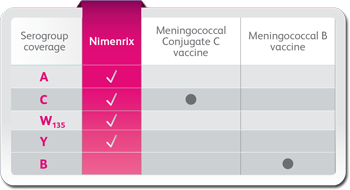 A quadrivalent meningococcal vaccine such as Nimenrix can help protect against 4 of 5 serogroups that commonly cause invasive meningococcal disease: A, C, W135 and Y. Up to 10% of people may carry the bacteria that causes meningococcal meningitis. Nimenrix is a vaccine that helps prevent illness caused by Neisseria meningitidis serogroups A, C, W135 and Y bacteria (germs). These bacteria can cause meningitis and septicemia, and can be highly infectious and are sometimes fatal. The vaccine works by causing the body to produce its own protection (antibodies) against these bacterial serogroups. The vaccine cannot cause these diseases. Your healthcare professional will give Nimenrix into the arm muscle (0.5 mL) as a single injection. Even if you have already been vaccinated, check with your doctor to make sure you have coverage for all 4 serogroups A, C, W135 and Y. Ask your doctor about the different vaccination requirements depending on your province of residence. should receive a booster, as a follow-up to initial serogroup C vaccination, with either a serogroup C or quadrivalent conjugate vaccine (to help protect against serogroups A, C, W135, and Y) at around 12 years of age (depending on their province). (children and adults) who are at increased risk of meningococcal meningitis due to medical conditions should be vaccinated against A, C, W135, and Y, regardless of destination. NACI recommends a periodic booster of a quadrivalent meningococcal vaccine such as Nimenrix every 5 years for people at high risk of invasive meningococcal disease or for those with ongoing risk of exposure. Although it is impossible to prevent germs from spreading, VACCINATION is the best way to prevent meningococcal meningitis. * Please see guidelines for complete information and recommendations. A vaccine, like any medicine, may cause serious problems, such as severe allergic reactions. The risk of Nimenrix causing serious harm is extremely small. The small risks associated with Nimenrix are much less than the risk associated with getting the disease. In infants, adolescents and adults, the most common side effects (reported in more than 1 in 10 doses of the vaccine) after having Nimenrix include loss of appetite, irritability, drowsiness, headache, fever, swelling, pain and redness at the injection site and fatigue. Other common side effects (in more than 1 in 100 doses of the vaccine) after having Nimenrix are gastrointestinal symptoms including diarrhea, vomiting and nausea, and injection site hematoma. Tell your healthcare professional as soon as possible if you or your child does not feel well after receiving Nimenrix. This is not a complete list of side effects. For any unexpected effects while taking Nimenrix, contact your healthcare professional. Please consult the Product Monograph for important information relating to adverse reactions, drug interactions, and dosing information which have not been discussed in this piece. The Product Monograph is also available by calling 1-800-463-6001. Nimenrix is a registered trademark of GlaxoSmithKline Biologicals SA, licensed to Pfizer Inc.